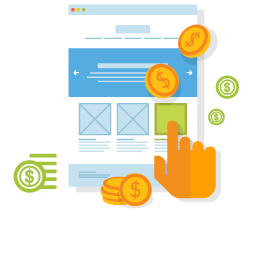 Pay Per Click can provide a instant impact and give your brand a much larger reach and exposure. Put your brand directly in front of the right prospects with PPC (Pay Per Click) and get more leads! Search Engine Marketing (SEM) or Pay Per Click (PPC) refers to advertising where the advertiser only pays for consumers that click on their ad and visit their website. Search engines like Google and Bing allow advertisers to run PPC ads on their search engine results page (SERP). The search engines allow advertisers precise control over the keywords where the ads show as well as the ads and location of the searcher and bid for each click. Our staff is trained in the most up to date SEM tools and techniques and certified with the top tier search engines.Similar to SEO, placing PPC ads on the SERP allows advertisers to show their ad to prospects who have expressed interest in related keywords. This means that PPC clicks have a higher intent to need your product or service than most other forms of advertising. If there is not a package here that seems to fit your needs, please don’t hesitate to reach out to us as we can put together a custom package to exactly fit your needs. PPC offers 100% measurable results. We can tell you which clicks convert to a sale or phone call. Reporting software displays intelligible analytics, including spending, goals, and cost-per-acquisition (CPA). Results can be strategically utilized to increase effectiveness of SEO campaign. Comprehensive reporting within the Google and Bing interface provides data about your campaigns in order to optimize your campaigns to yield the best results possible. Our PPC Analysts are all rigorously trained, results-driven, and there to support you.